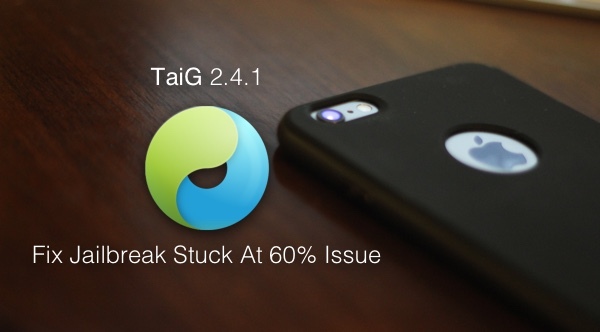 TaiG version 2.4.1 is now out to fix jailbreak getting stuck at 60% issue during iOS 8.4 jailbreak process. Team TaiG first released 2.4.1 as a beta and after receiving positive feedback, have now made it available to download for everyone. So if you have had no luck jailbreaking with previous versions of TaiG, give TaiG 2.4.1 a try. It will likely get past that dreaded stuck at 60% problem. This release comes only a few days after version 2.3.1 was released with Cydia 1.1.20 bundled as part of the jailbreak tool. 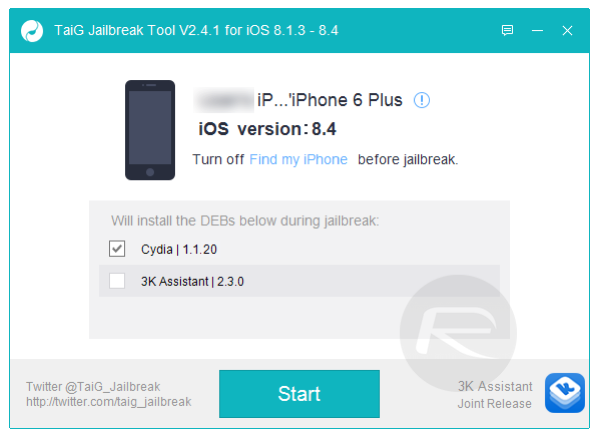 If you are already jailbroken on iOS 8.4, you don’t need to do anything. Just make sure you are running the latest version 2.3 of TaiG 8.1.3-8.x Untether package from Cydia with all the required updates and fixes. You can find this package on Cydia’s default Telesphoreo repository. New jailbreakers are advised to use 2.4.1 version of TaiG from here on. Links for download plus instructions on how to jailbreak are linked at the foot of this post. Earlier today, Saurik released Cydia Installer version 1.1.22 with important fixes. To learn about what’s new in this release and how to update on your device, check out the details here. Still available for Windows only, TaiG can jailbreak all iPhone, iPad and iPod touch devices running iOS 8.4, 8.3, 8.2 and 8.1.3. If you are having any other issue during or after TaiG iOS 8.4 jailbreak, check out our complete troubleshooting guide for a resolution: Fix TaiG iOS 8.4/8.3 Jailbreak Stuck At 20% Error 1101, 1102, 1103 And More [Troubleshooting Guide]. again, i can see cydia logo at home screen. why u can easily install windows 7 on ur mac using virtual machine…. If you research you will find that TAIG does not run under WIN7 VM so don’t talk to me like I am a child as I know what does work and what does not and in your case you are wrong, WIN7 does not run TAIG in a VM. So i tried installing the driver but 1-it wont install even though I ran as an administrator, 2- it deletes the driver as soon as i try to install it. Plus, my TaiG still says the apple driver has not been found. can anyone help me out??? Help! when I opened up my device after the installation of TaiG 2.4.1 Settings,safari,contacts and every other default app went missing. Please Help! I still can’t get passed 60% & it gives me a different error code each time. Why don’t you just ask someone if you can use their Windows machine for a minute? The other 99% of the world has one, so it’s not as if they’re scarce. And honestly, who doesn’t have dual boot for Windows, if they have a Mac, and why bother posting that “you’re still waiting for the Mac version”, as if the devs are supposed to sit around writing code for free, just to appease your tiny minority, and then you go on to not only insult them, but also insult other people trying to help you…. please can i jailbreak without turning the findmy iPhone off ?! AT&t were database renew, this means that many սոⅼοсking sites are unable to սոⅼοсking AT&T anymore, but I know a website that does, you will look up just google atttiphoneeuunlocking, we are still able to ՍΝᏞΟᏟΚing any AT&T phones.